SKU: LVFM-TPD1. 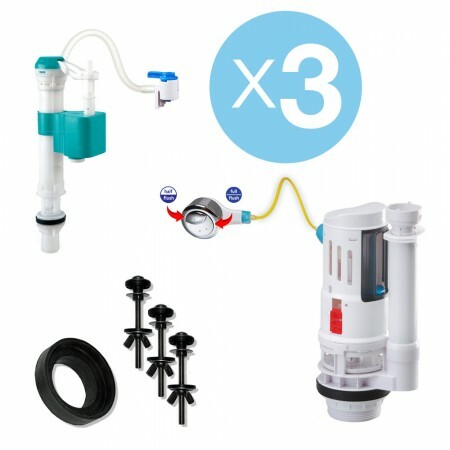 Categories: 2" Valve, Deluxe Kits (Dual FlushSaver + Tank FillerSaver), Featured, Lever, Two Piece. 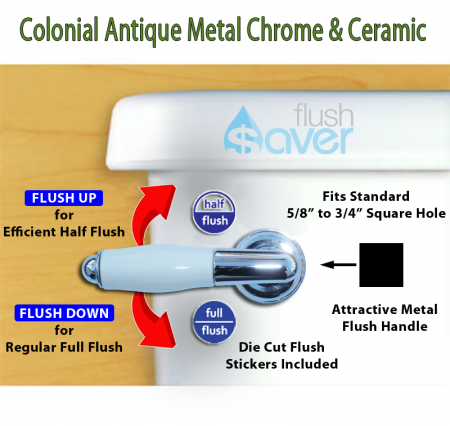 FlushSaver Colonial Antique METAL & WHITE CERAMIC LEVER HANDLE Dual-Flush DELUXE DIY Conversion Kit – FITS STANDARD 2″ DRAIN TWO PIECE TOILETS. 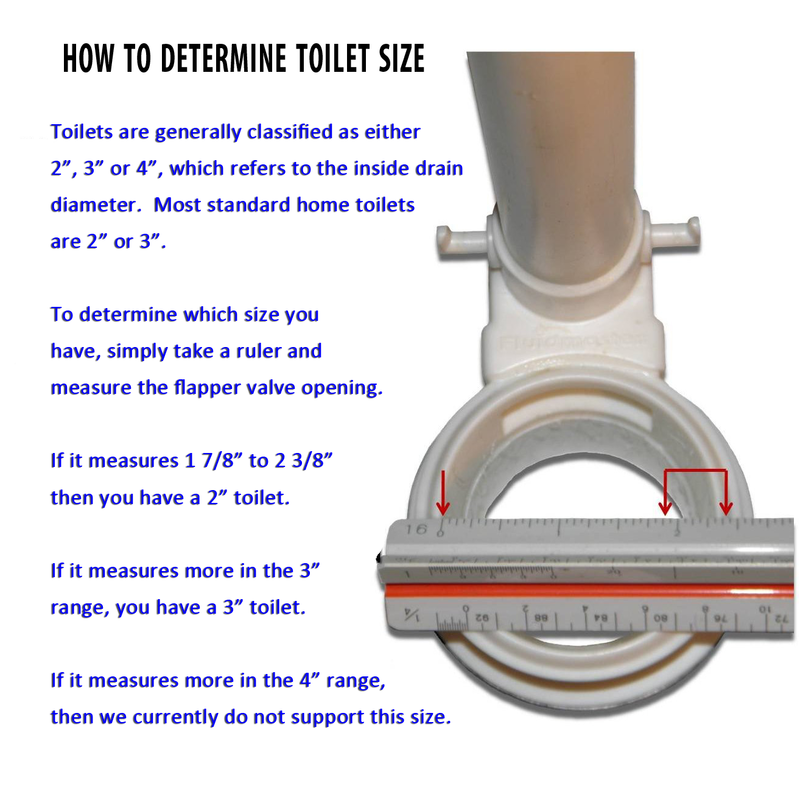 Converts standard toilets into efficient dual-flush systems. 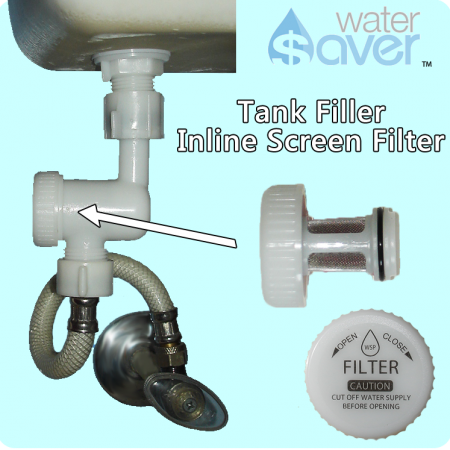 FillerSaver ADJUSTABLE TANK FILLER VALVE with Bowl Fill Regulator and Reusable In-Line Filter. 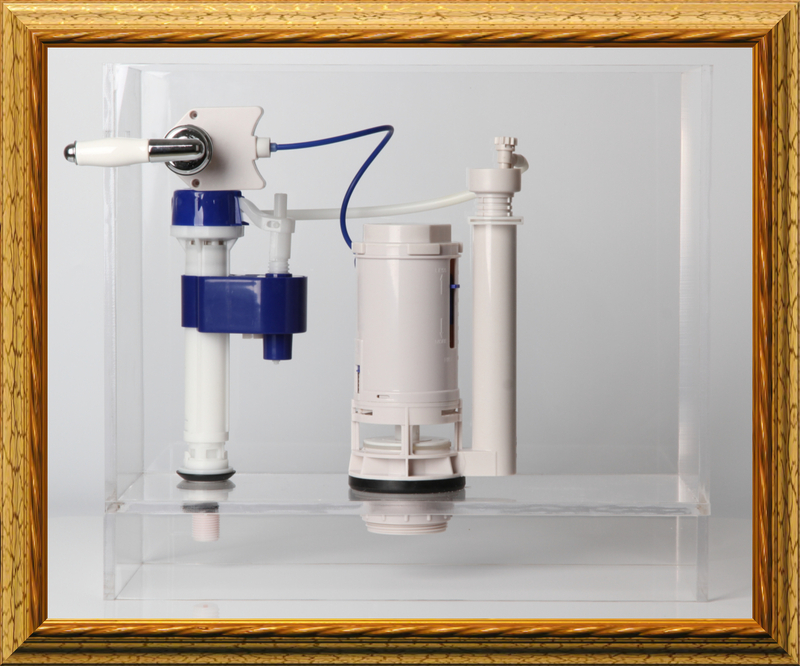 CONVERVES WATER by reducing bowl overfill and SAVES on REPAIR COST by trapping harmful sediment that can clog and ruin the valve seals. Slim Design Fits Any Tank Size and is Fully Adjustable for Height, Water Level and Bowl Fill Quantity. 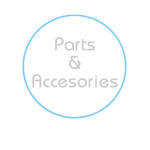 DELUXE KIT also includes Tank-to-Bowl Gasket, Choice of Bolts, Pair of Flush Indicator Labels and Quick Install Instructions. 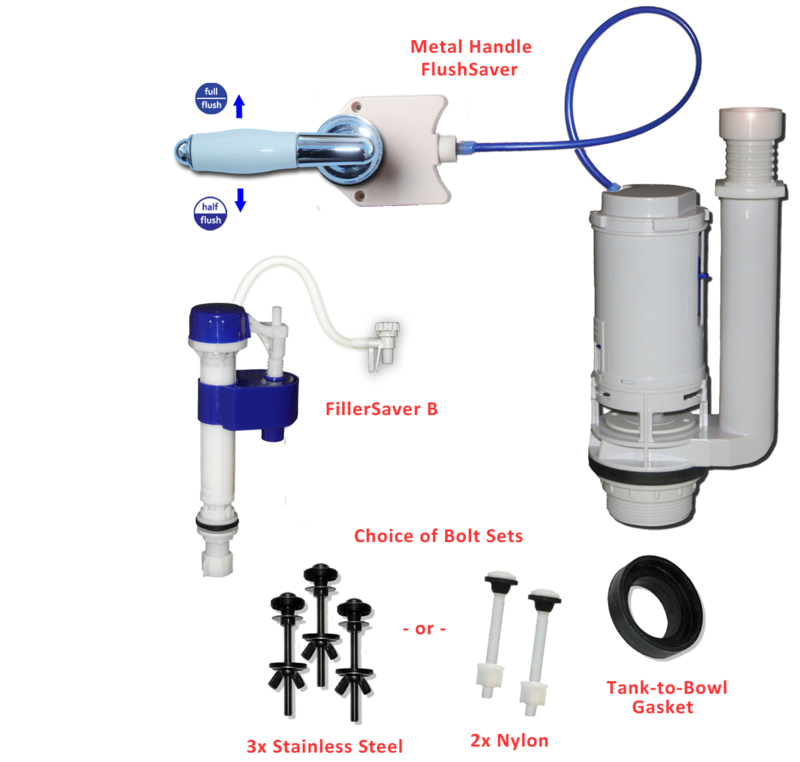 Exclusive Metal Handle FlushSaver Kit – Not Available from other suppliers. 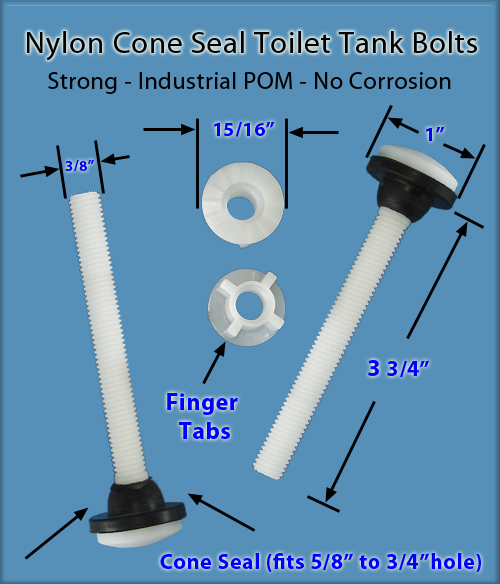 Colonial Porcelain and Chrome SOLID METAL Flush Handle Dual Flush Kit converts standard toilets into modern dual flush systems while maintaining the SAME outward vintage look. 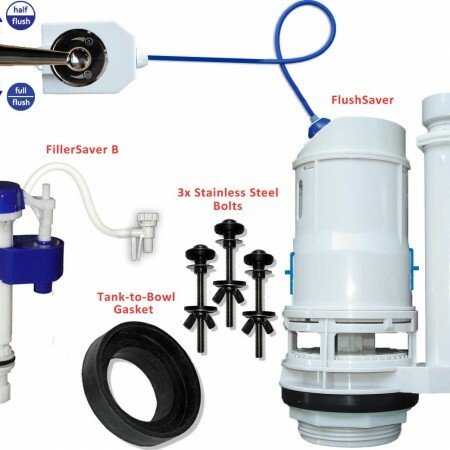 FlushSaver Dual-Flush DIY Conversion Kit is EASY to operate for anyone because it looks and works the same as a traditional flush handle toilet, but with one big difference . . . while the handle is simply toggled downward as usual for higher water-volume “Number Two” flushes, it can also be toggled upward for those little water-saving “Number One” flushes. Further, a pair of Die Cut Flush Indicator labels (one for Full Flush and one for Half Flush) are included for marking the flush direction. The flush handle can also be positioned with the lever pointing downward for a LEFT-RIGHT flush orientation if preferred. Both the “regular flush” and “small flush” release enough water to fully cycle and empty the bowl, but the small flush is less aggressive and uses approximately 1/3 less water . . . adding up to over 10,000 gallons saved for an average family of four. Further, both cycles are adjustable to suit your particular tank size and water use preferences. Then why keep wasting money on cheap fill valves that don’t last and can’t be cleaned or repaired? 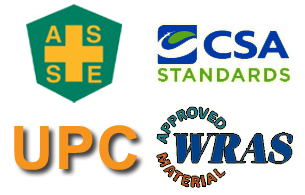 Most fill valves fail due to sediment build up or dried seals due to chlorinated water. The FillerSaver Valve is made to last because of its unique IN LINE FILTER that can be removed for cleaning as required. 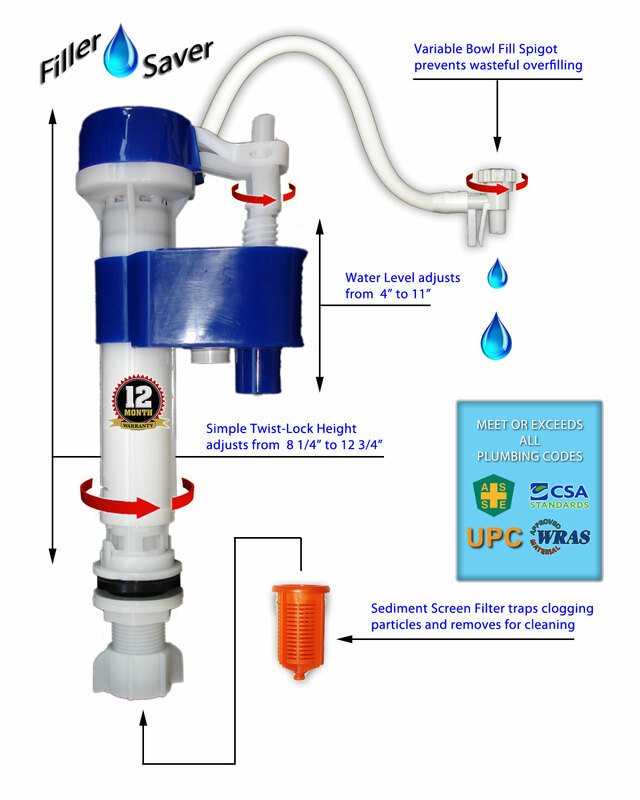 Plus, the included Bowl Fill Valve saves an additional several THOUSANDS of GALLONS per YEAR by reducing bowl fill waste. See for yourself . 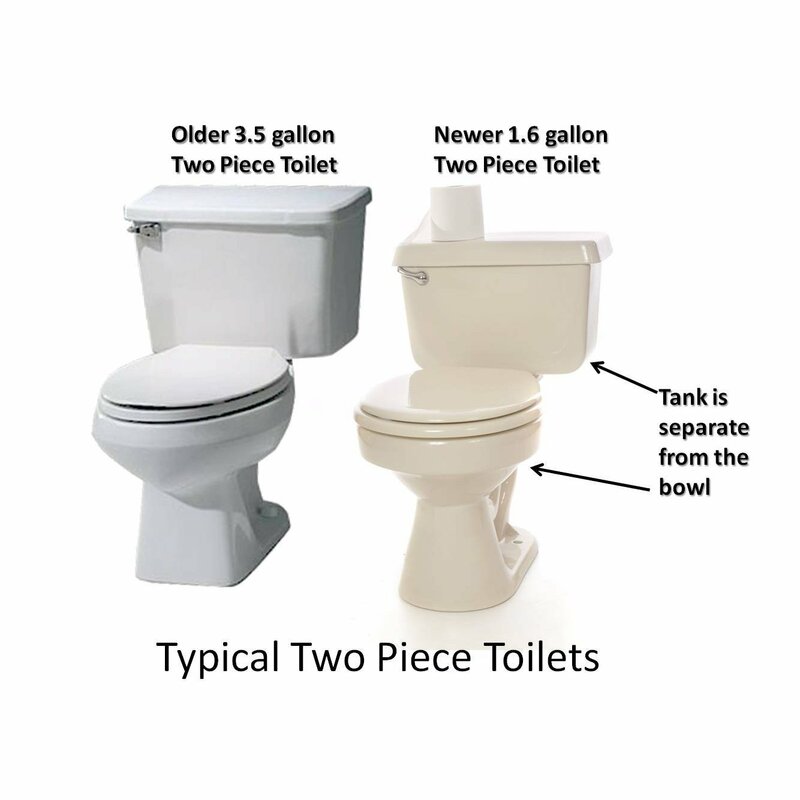 . . remove the tank lid from your toilet, flush and then watch how much extra water drains down into the bowl and then right down the drain. What a senseless waste when water prices are going up and the remedy is so FAST and EASY. EVERYTHING is INCLUDED in this kit to fully replace ALL of the parts inside the tank as shown. The leaky and wasteful flapper mechanism is replaced with a MODERN adjustable, dual-action piston and seal evacuator column, while the old-style ballcock valve is replaced with a QUIET and SERVICEABLE filler valve. 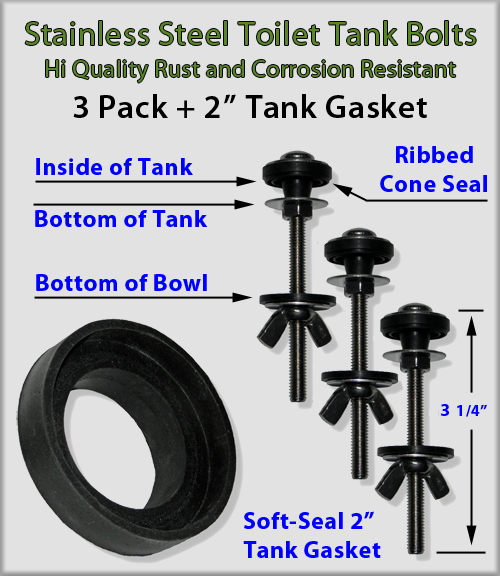 This kit also includes a new tank gasket and your choice of either an INDUSTRIAL POM NYLON 2 Bolt set or a stronger non-corroding STAINLESS STEEL 3 bolt set for a complete tank overhaul job. 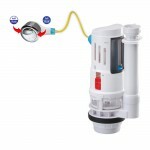 Anyone with basic DIY home plumbing repair experience can install this simple valve and filler system . . . 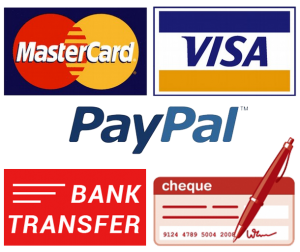 MINIMUM COMMON TOOLS REQUIRED. This is a Practical, Effective and No Nonsense GREEN home product. 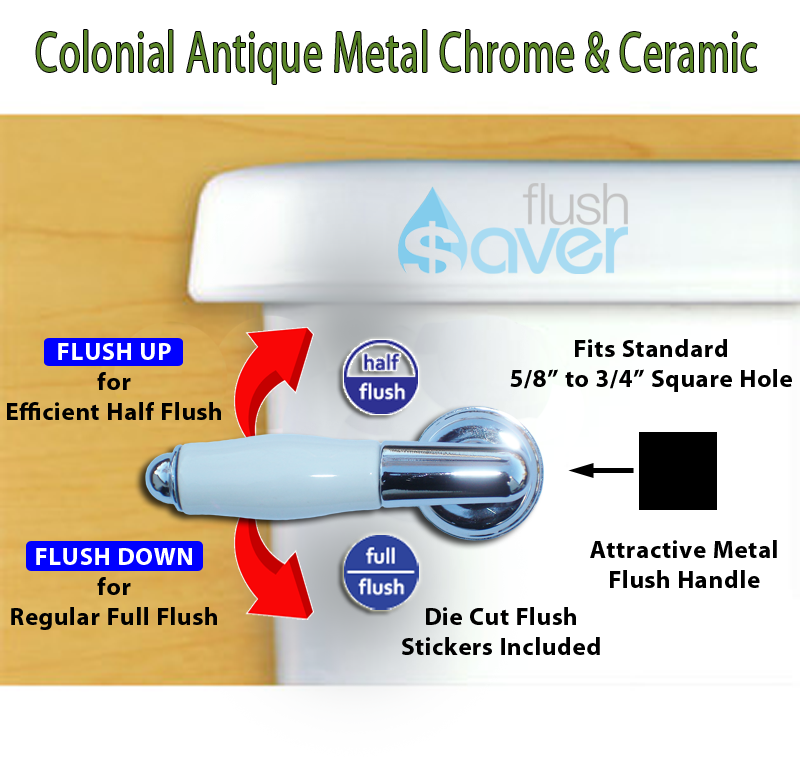 My wife wanted to redo one of our bathrooms in a Colonial style so I went looking for a white ceramic flush handle. Turns out our local plumbing fixture shop did have them, but price of the flush handle alone was $45 . . . ugh! So I had been thinking I might as well rebuild the toilet while I was at it anyway and found this whole dual flush kit for less than the price of the handle. I was skeptical about the handle quality, but it is a nice heavy weight metal with a real ceramic insert. Plus, the knob at the end unscrews to allow the ceramic insert to be substituted for another color or wood if I want later. Really like this kit and its a great value. 5 stars . . . Mason K.